The Vello LCD Screen Protector (Optical Acrylic) is designed to protect your camera's screen from scratches, dings, sweat, oily fingerprints, and life's daily grind. Made of 1mm thick polycarbonate this protector guards your valuable camera's screen from dirt, scratches and oily fingerprints. 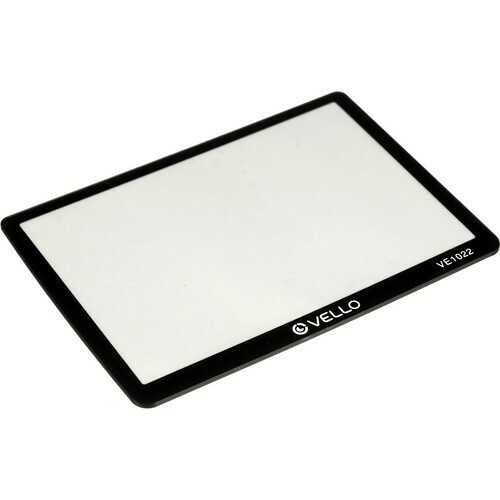 Plus, it blocks UV rays while allowing 92% visible light transmission for clear and bright images. The protector is easily mounted to your camera's LCD screen with an adhesive backing. Once it is properly aligned, the screen should be smoothed down with a clean cloth. dust or scratches on the screen can ruin a shoot like nothing else so of course whenever i get a new camera I buy a screen proctector. This is one of the cheapest screen protectors I ever bought and it is so clear I can't even tell it is there. Except when when a speck of dust gets on it and I can wipe it away without worrying about ruining my screen. Then I know its there and I am super thankful I made this investment to protect my equipment. In short, it is really clear and does its job of keeping my screen safe. After spending so much on my camera and equipment protecdting it for less than ten bucks is a no brainer!